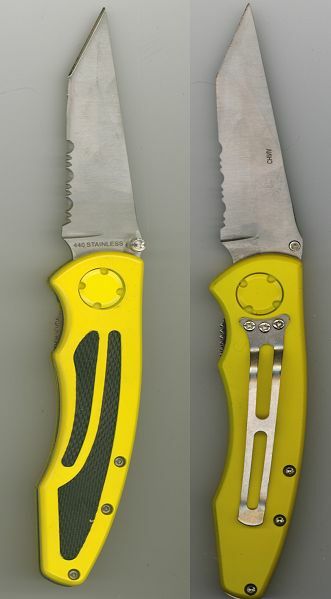 This folding lock back pocket knife has a yellow metal handle with a black rubber inlay for a good grip. The blade is made of 440 stainless steel and is approximately 3 3/8 inch long. The blade is half serated and has a thumb knob for quick opening. Overall length when open is approximately 8 inches, and 4 1/2 inches when closed. This item is on Close Out and will be discontinued once our current supply is exhausted.